If you do not already have a XenApp Services site created, in the XenApp console or Web Interface console (depending on the version of XenApp you have installed), create a XenApp Services site for mobile devices. The Receiver for mobile devices uses a XenApp Services site (formally Program Neighborhood Agent site) to get information about the applications a user has rights to and presents them to the Receiver running on the device. This is similar to the way you use the Web Interface for traditional SSL-based XenApp connections for which an Access Gateway can be configured. XenAppServices sites running on the Web Interface 5. x have this configuration ability built in. Configure the XenApp Services site for the Receiver for mobile devices to support connections from an Access Gateway connection. In the XenApp Services site, select Manage secure client access > Edit secure client access settings. Change the Access Method to Gateway Direct. Enter the FQDN of the Access Gateway appliance. Enter the Secure Ticket Authority (STA) information. If double source authentication is required (such as RSA SecurID and Active Directory), RSA SecurID authentication must be the primary authentication type. Active Directory authentication must be the secondary authentication type. RSA SecurID uses a RADIUS server to enable token authentication. Active Directory authentication can use either LDAP or RADIUS. Note: For servers prior to Windows Server 2003, Active Directory can use Integrated Windows authentication, also known as NTLM. Test a connection from a user device to verify that the Access Gateway is configured correctly in terms of networking and certificate allocation. Create a session policy on the Access Gateway to allow incoming XenApp connections from the Receiver, and specify the location of your newly created XenApp Services site. In the associated profile configuration for the session policy, on the Security tab, set Default Authorization to Allow.On the Published Applications tab, if this is not a global setting (you checked the Override Global check box), ensure the ICA Proxy field is ON.In the Web Interface Address field, enter the URL including the config.xml for the XenApp Services site that the device users use, such as http://XenAppServerName/Citrix/PNAgent/config.xml or http://XenAppServerName/CustomPath/config.xml. Bind the session policy to a virtual server. Create authentication policies for RADIUS and Active Directory. Bind the authentication policies to the virtual server. Important: If the server certificate used on the Access Gateway is part of a certificate chain (with an intermediate certificate), make sure that the intermediate certificates are also installed correctly on the Access Gateway. For information about installing certificates, see the Access Gateway documentation. 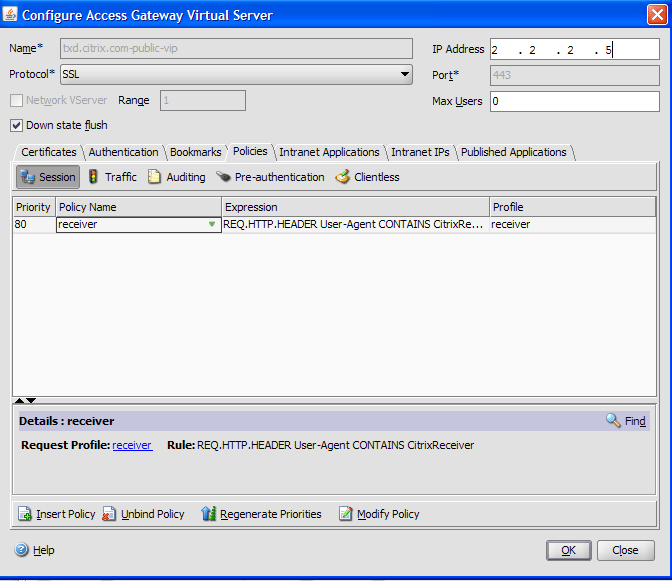 In Account Settings, in the Address field, enter the matching FQDN of your Access Gateway server, such as FQDNofAccessGateway. In the Citrix Access Gateway settings, turn on Access Gateway, set the Gateway Type to Enterprise edition, and select the authentication method.